Over the course of a little over 40-years (1820-1863 – the “Missionary Period,”) the American Board of Commissioners for Foreign Mission (ABCFM) sent twelve Companies of missionaries – 184-missionaries; 84-men and 100-women – to the Hawaiian Islands. By the time the Pioneer Company arrived (1820,) Kamehameha I had died (1819) and the centuries-old kapu system had been abolished, through the actions of King Kamehameha II (Liholiho, his son,) with encouragement by his father’s wives, Queens Kaʻahumanu and Keōpūolani (Liholiho’s mother.)) Keōpūolani later decided to move to Maui. “On the 26th of May (1823) we heard that the barge (Cleopatra’s Barge, or “Haʻaheo o Hawaiʻi,” Pride of Hawaiʻi) was about to sail for Lahaina, with the old queen (Keōpūolani) and princess (Nāhiʻenaʻena;) and that the queen was desirous to have missionaries to accompany her”. Keōpūolani is said to have been the first convert of the missionaries in the Islands, receiving baptism from Rev. William Ellis in Lāhainā on September 16, 1823. Keōpūolani was spoken of “with admiration on account of her amiable temper and mild behavior”. (William Richards) She was ill and died shortly after her baptism. The tenth ABCFM Company arrived in the Islands on September 24, 1842 on the Sarah Abagail from Boston. On board were Rev George Berkeley Rowell (1815-1884) and wife Malvina Jerusha Chapin (1816-1901) and Physician James William Smith (1810–1887) and wife Melicent Knapp Smith (1816–1891.) They were assigned to the station on Kauai. Born in Stamford, Connecticut in 1810 to a farm family, James William Smith became a school teacher at 17, and had a religious conversion at 19. He studied religion for about 3-years until he became ill in 1834 and was unable to complete his studies to enter the ministry. Turning to medicine, he attended the College of Physicians and Surgeons of New York, and proceeded to practice there for about five years. He applied for missionary work in 1840, and married Melicent Knapp. The couple would provide missionary, educational and medical help to the islands for the next 45 years. Their son, William Owen Smith, born at Kōloa, Kauai, was educated at Rev David Dole’s school at Kōloa, later attending Punahou School in Honolulu; Smith left school to go to work on a sugar plantation for three years to learn the sugar industry, working in the boiling house in winter and in the fields in summer. Smith was Sheriff of Kauai for two years and Maui for two years. He later became a lawyer and state legislator. During the revolutionary period, Smith was one of the thirteen members of the Committee of Safety that overthrew the rule of Queen Liliʻuokalani (January 17, 1893) and established the Provisional Government. He then served on the executive council of the Provisional Government and was sent to Washington DC when the proposed Organic Act for the Government of Hawaiʻi was pending before Congress. When not filling public office, Mr. Smith had been engaged in private law practice and was affiliated with various law firms during his long career. Smith was also a trustee of the Bernice Pauahi Bishop Estate from 1884-1886 and 1897-1929, the Lunalilo Estate, the Alexander Young Estate and the Children’s Hospital. On April 24, 1873, while serving as Sheriff on Maui, William Owen Smith planted Lāhainā’s Indian Banyan to commemorate the 50th anniversary of the first Protestant mission in Lāhainā. Today, shading almost an acre of the surrounding park and reaching upward to a height of 60 feet, this banyan tree is reportedly the largest in the US. Its aerial roots grow into thick trunks when they reach the ground, supporting the tree’s large canopy. There are 16 major trunks in addition to the original trunk in the center. 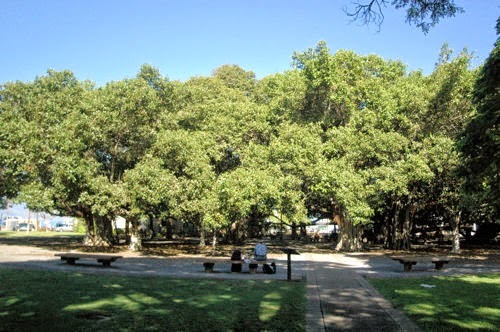 The image shows the Lāhainā banyan tree. In addition, I have added some other images in a folder of like name in the Photos section on my Facebook and Google+ pages. He was employed with his father on the farm, enjoying the benefits of the common school, and generally in winter of a select school, till the age of sixteen. In the fall of 1814, he commenced the study of Latin, with a view to prepare for College. The last of his teachers being a graduate of Williams College, he was induced to enter at Williams, where he spent two years; and then he left Williams and entered Yale College, where he graduated in September, 1821. By the recommendation of President Day, the next two years he was employed as Principal of the Academy in Kingston, Ulster County, NY. A third year was spent in teaching a select school in Catskill, Greene county. He then devoted himself to the study of medicine, at the same time teaching a select school in Durham, NY. 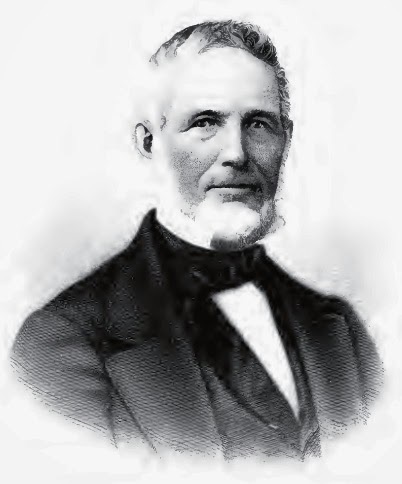 He soon came to the decision to join a mission, and September 3, of that year, he united with the Congregational Church in Durham, NY, and soon after he entered the Theological Seminary at Auburn, where he spent three years, offering his services into the American Board of Boston for a Foreign Mission … and they were accepted. He did not have time to await official recognition of his medical degree so at direction of the Prudential Committee he took his diploma as Master of Science. He was ordained at Utica, NY on October 6, 1830. It was also a thriving harbor in those days, being a port of call for the whale ships which sometimes filled the bay so full that one could jump from one deck to another. Baldwin preached at the Waine‘e Church (“Moving Water;”) the cornerstone was laid on September 14, 1828, for this ‘first stone meeting-house built at the Islands,’ It was dedicated on March 4, 1832. The Hawaiian royalty attended services there. A series of epidemics swept through the Hawaiian Islands in the 1840s, whooping cough and measles, soon after followed by waves of dysentery and influenza; then, in 1853, a terrible smallpox epidemic. Although precise counts are not known, there were thousands of smallpox deaths on O‘ahu; Baldwin is credited with keeping the toll to only a few hundred on Maui. It was with regret that Baldwin resigned his pastorate at Lāhainā, in September, 1868. That year Father Baldwin became associated with Reverend Benjamin Parker in the conduct of the native Theological Seminary at Honolulu; the Baldwins moved to Honolulu in 1870. Mother Baldwin died on October 2, 1873; the inscription on her tombstone reads, “A life of work, love and prayer;” Dwight Baldwin died on January 3, 1886. The Baldwins had eight children: David Dwight (1831–1912), Abigail Charlotte (1833–1913), Charles Fowler (1837–1891), Henry Perrine (1842–1911), Emily Sophronia (1844–1891) and Harriet Melinda (1846–1932). A daughter, Mary Clark died at about 2½ years of age in 1838; a son, Douglas Hoapili, died at almost 3 in 1843. The image shows Dwight Baldwin. In addition, I have added other related images in a folder of like name in the Photos section on my Facebook and Google+ pages. The central location of the Hawaiian Islands between the continent and Japan whaling grounds brought many whaling ships to the Islands. Whalers needed food and the islands supplied this need from its fertile lands. Between the 1820s and the 1860s, the Lāhainā Roadstead was the principal anchorage of the American Pacific whaling fleet. During that time, up to 1,500 sailors at a time were on the streets of the small town. One reason why so many whalers preferred Lāhainā to other ports was that by anchoring in a roadstead from half a mile to a mile from shore they could control their crews better than when in a harbor. During Armas’ occupation, on January 24, 1841, the first Catholic mass on Maui was celebrated in the house. (Bergin) Armas left the Islands in 1844. On February 4, 1844, Milo Calkin was appointed US Vice Commercial Agent for the port of Lāhainā by William Hooper, acting United States Commercial Agent. One of his duties was to arrange for medical care for sick sailors. By August 1844, the US Marine Hospital was opened on the Armas site. Back then, the hospital business was divided into three major sections. The Commercial Agent (Calkin was the first) was responsible for recommending seamen to the hospital, keeping necessary papers and books, and handling the financial transactions. A physician of the hospital (the first in Lāhainā was Dr Charles Winslow) had a contract with the US States Government which guaranteed him exclusive treatment of American seamen at US expense. The hospital (sometimes referred to as the ‘Seamen’s Hospital’) continued until 1862. A couple things caused it to close – (1) demand was dwindling (in 1859, an oil well was discovered and developed in Titusville, Pennsylvania; within a few years this new type of oil replaced whale oil for lamps and many other uses – spelling the end of the whaling industry) and (2) a festering scandal surfaced accusing misuse of government funds. The situation continued for a few more years, but when the total amount spent for the hospitals in Honolulu, Lāhainā and Hilo reached more than $150,000 per year, an investigation was demanded by the Treasury Department. US Commissioner in Hawaii, James W Borden, investigated the workings of the United States hospital and consular system in Honolulu, Lāhainā and Hilo. The US Marine Hospital (Seamen’s Hospital) in Lāhainā officially closed on September 10, 1862. In 1865 the Anglican sisters founded St. Cross School for Girls at the Marine Hospital premises, at first leasing the property and finally purchasing it in 1872. The Sisterhood opened a similar school – St Andrew’s Priory – on May 30, 1867. The Lāhainā school continued to operate until 1877. The image shows the US Marine Hospital (Seamen’s Hospital.) (National Library Of Medicine) In addition, I have added others similar images in a folder of like name in the Photos section on my Facebook and Google+ pages. Maui is known for its beaches and water activities, and the west side, including Lāhainā, boasts some of the most beautiful shores in Hawaiʻi, and it also has the distinction of having some of the most beautiful sunset views on the planet. Lāhainā is the second most visited place in Maui – (behind the beaches) – a combination of natural scenic beauty, white sandy beaches, lush green uplands, near-perfect weather, rich culture and a great Hawaiian history in its sunny shores. From 700 AD to the present, Lāhainā’s Front Street has experienced six major historical eras, from its days as an ancient Hawaiian Royal Center, capital and home of the Hawaiian Monarchy, home to Missionaries, Landing/Provisioning for Whalers, the Sugar and Pineapple Plantation era and now Tourism. All are still visible in town. Lāhainā has played an important role in the history of Maui and the neighboring islands of Moloka‘i, Lānaʻi and Kahoʻolawe, with Lāhainā serving as the Royal Center, selected for its abundance of resources and recreation opportunities, with good surfing and canoe-landing sites. Probably there is no portion of the Valley Isle, around which gathers so much historic value as Lāhainā. It was the former capital and favorite residence of kings and chiefs. After serving for centuries as home to ruling chiefs, Lāhainā was selected by Kamehameha III and his chiefs to be the capital and seat of government; here the first Hawaiian constitution was drafted and the first legislature was convened. Hawai‘i’s whaling era began in 1819 when two New England ships became the first whaling ships to arrive in the Hawaiian Islands. Over the next two decades, the Pacific whaling fleet nearly quadrupled in size and in the record year of 1846, 736-whaling ships arrived in Hawai’i. Lāhainā was the port of choice for whaling ships. Central among the islands, Lāhainā was a convenient spot from which to administer the affairs of both Hawaiian and foreigner. The anchorage being an open roadstead, vessels can always approach or leave it with any wind that blows. No pilot is needed here. Vessels generally approach through the channel between Maui and Molokaʻi, standing well over to Lānaʻi, as far as the trade will carry them, then take the sea breeze, which sets in during the forenoon, and head for the town. The Christian religion really caught on when High Chiefess Keōpūolani (widow of Kamehameha I and mother of future kings) is said to have been the first convert of the missionaries in the islands, receiving baptism from Rev. William Ellis in Lāhainā on September 16, 1823. In 1831, classes at the new Mission Seminary at Lahainaluna (later known as Lahainaluna (Upper Lāhainā)) began. The school was established by the American Board of Commissioners of Foreign Missions “to instruct young men of piety and promising talents” (training preachers and teachers.) It is the oldest high school west of the Mississippi River. Per the requests of the chiefs, the American Protestant missionaries began teaching the makaʻāinana (commoners.) Literacy levels exploded. From 1820 to 1832, in which Hawaiian literacy grew by 91 percent, the literacy rate on the US continent grew by only 6 percent and did not exceed the 90 percent level until 1902 – three hundred years after the first settlers landed in Jamestown – overall European literacy rates in 1850 had not been much above 50 percent. The early Polynesian settlers to Hawaiʻi brought sugar cane with them and demonstrated that it could be grown successfully. It was not until ca. 1823 that several members of the Lāhainā Mission Station began to process sugar from native sugarcanes for their tables. By the 1840s, efforts were underway in Lāhainā to develop a means for making sugar as a commodity. Historically Maui’s second largest industry, pineapple cultivation has also played a large role in forming Maui’s modern day landscape. The pineapple industry began on Maui in 1890 with Dwight D. Baldwin’s Haiku Fruit and Packing Company on the northeast side of the island. Starting in the 1850s, when the Hawaiian Legislature passed “An Act for the Governance of Masters and Servants,” a section of which provided the legal basis for contract-labor system, labor shortages were eased by bringing in contract workers from Asia, Europe and North America. It is not likely anyone then foresaw the impact this would have on the cultural and social structure of the islands. The sugar industry is at the center of Hawaiʻi’s modern diversity of races and ethnic cultures. Of the nearly 385,000 workers that came, many thousands stayed to become a part of Hawai‘i’s unique ethnic mix. Hawai‘i continues to be one of the most culturally-diverse and racially-integrated places on the globe. Tourism exploded. Steadily during the 1960s, 70s and 80s, the millions of tourists added up. A new record number of visitor arrivals (over 7.8-million visitors) came to the islands in 2012. Tourism is the activity most responsible for Hawaiʻi’s current economic growth and standard of living. To commemorate Lāhainā’s rich heritage, the Lāhainā Interpretive Plan Team has designed a series of interpretive signs and orientation maps called Ala Hele Moʻolelo O Lāhainā, the Lāhainā Historic Trail, which is now installed throughout Lāhainā’s two historic districts surrounding Front Street. Lāhainā Restoration Foundation participated in this trail formation. The historic “trail” is not really a trail, but rather identification of the historical sites scattered throughout Lāhainā. Many have been restored by the Lāhainā Restoration Foundation, and can be found within the core of Lāhainā. This self-guided walking tour provides a view of each era of the town that is considered one of the most historically significant places in Hawai’i. Lāhainā is a place where history and culture come alive. The image shows the Ala Hele Moʻolelo O Lāhainā, the Lāhainā Historic Trail. In addition, I have added related images in a folder of like name in the Photos section on my Facebook and Google+ pages. The first capital of the kingdom of Hawai‘i, Lāhainā, was also once a bustling whaling town and plantation settlement. 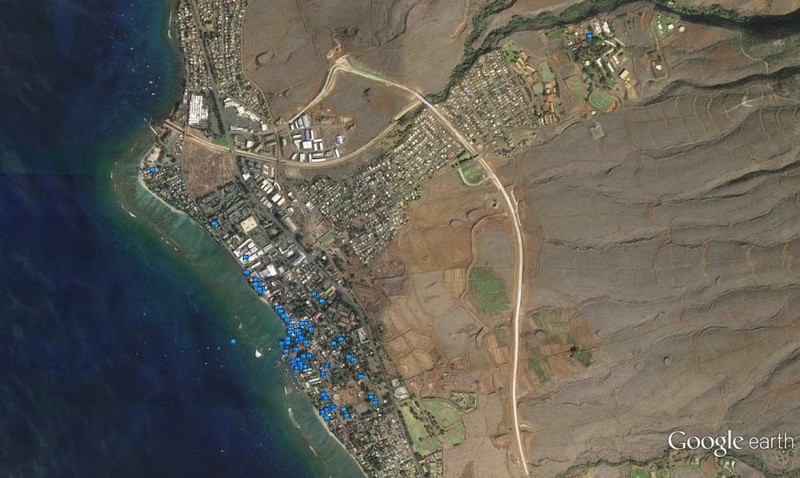 To recognize and preserve its rich history, two sets of historic districts have been created in Lāhainā. The first, the Lāhainā Historic District encompassing about 1,665 acres, was added to the National Park Service’s (NPS) National Historic Landmarks Program in December 1962. Maui County Historic District Boundaries 1 and 2 cover about 65 acres in Lāhainā. 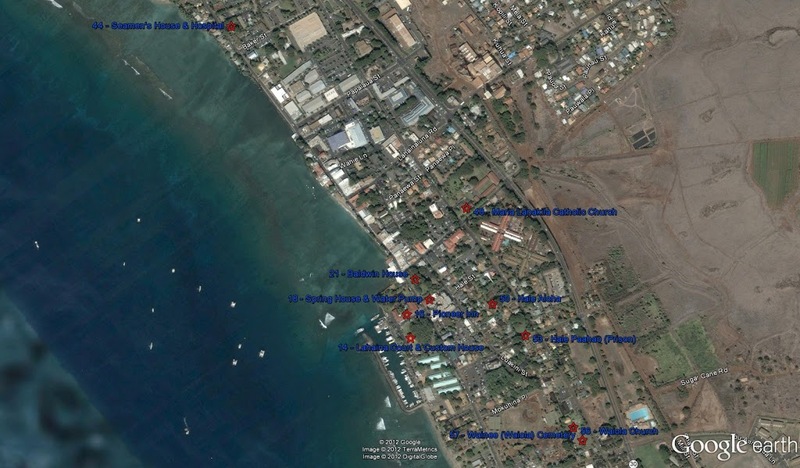 This summary highlights the nine structures that were identified in the Lāhainā Historic District (NPS;) the principal historic structures and sites still visible include the following. 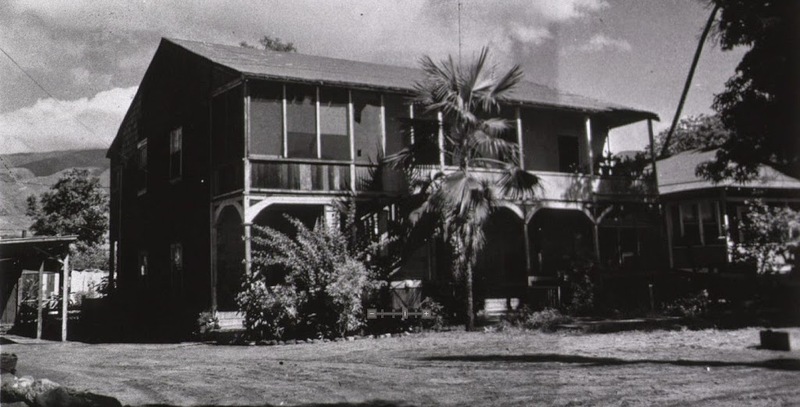 The description of the hotel in one guide book – ‘a large box of a building … with a wide balcony and decorative wooden railing’ – may be accurate, but it fails to convey the tropical atmosphere of Lāhainā’s first hotel. The Old Spring House is said to have been built by the Rev. William Richards in 1823 to enclose a spring to supply water not only for his own dwelling nearby, but for the entire community and for ships anchored off the town. According to local tradition, a hand pump here was visited by crews of sailors who ‘constantly rolled huge casks for water.’ The Spring House apparently is thus one of the few remaining physical links with the whaling era. Completed early in 1835, Dr. Dwight Baldwin and his family occupied this two-story home, built of coral blocks, it until Dr. Baldwin was transferred to Honolulu in 1868 (some sources say the Baldwins lived in the house until 1871.) It is one of the oldest and best preserved missionary dwellings. Dr. Baldwin, in addition to serving as pastor of the Hawaiian church at Lāhainā and, for a time, as seamen’s chaplain, was a medical doctor; and he was government physician for the islands of Maui, Moloka‘i, and Lāna‘i. Dr. Baldwin’s son, Henry P. Baldwin, was born in this house. Around 1842, this hospital was established for sick and injured American merchant seamen. The hospital could accommodate about 60 men; it’s on the landward side of Front Street, between Kenui and Baker Streets, about 0.6 mile north of the Baldwin House. In 1865, the structure was sold to the Episcopal Church and became a school for girls, and during the 1870s it was turned into a vicarage and served as such for more than 30 years. The present concrete church, erected in 1927-1928, was built on the same foundation and is almost a replica of the older frame structure, it is said that the original ceiling was retained in the new building. The meetinghouse was in bad condition by 1855 and the church voted to rebuild completely, the walls being ‘too old fashioned to be tolerated in these go-ahead days.’ The present building, called ‘Hale Aloha,’ was completed in 1858 and was ‘the largest sectional meeting house of its time.’ In 1860, the government fitted it out for use as an English Church. A new prison was started in 1852. The main cell block, built of planks, was constructed in that year, but the wall around the grounds, built of coral blocks from the old fort, was not erected until about 1854 (at the corner of Waine‘e Street and Prison Road.) Prisoners performed much of the labor. The cornerstone was laid on September 14, 1828, for this “first stone meeting-house built at the Islands.” Dedicated on March 4, 1832, this large, two-story, galleried Waine‘e Church was twice destroyed by Kauaula winds and once, in 1894, by a fire of incendiary origin. The present church structure was dedicated in 1953, at which time the name was changed to Waiola. The adjoining cemetery is said to date from 1823. It contains the body of Keōpūolani, wife of Kamehameha the Great and mother of Kamehameha II and Kamehameha III. Other prominent Hawaiian nobles interred here include Governor Hoapili, King Kaumuali‘i, Princess Nahi‘ena‘ena, Queen Kalākua and Governess Liliha. I have added other images in a folder of like name in the Photos section on my Facebook page.